Celebrities have recently been in the news as supporters of mandatory GMO labeling. We have written in the space before about how mandatory GMO labeling will not be good for anyone, be it a farmer, food processor, or the consumer. Going a step further and investigating the data will show one that GMOs have been beneficial to cotton farmers. Using USDA-NASS statistics from 1866 – 2013 to generate the graph below, one can see that the Georgia cotton farmer has gone from producing 2.7 million bales on 5.1 million acres in 1914 to producing 2.9 million bales on 1.45 million acres in 2012. 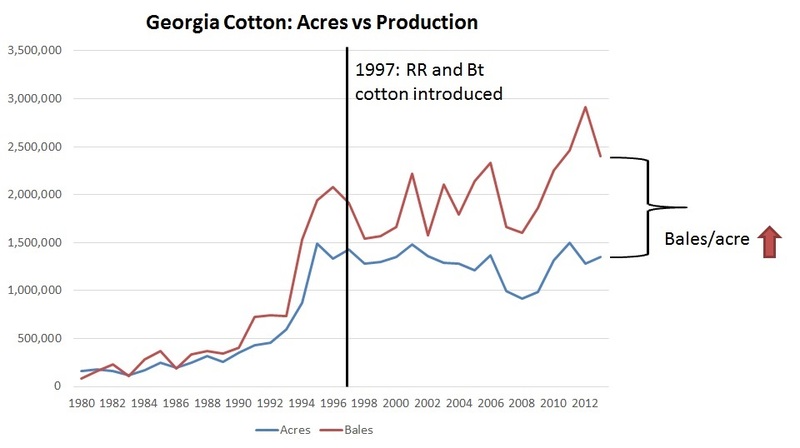 This is a true testament of the combined hard work of farmers, scientists, and the industry to increase the per acre yield and quality of Georgia cotton. Many events such as the eradication of the boll weevil, introduction of strip-tillage, and new crop protection chemistries have lead to this dramatic increase in yields. 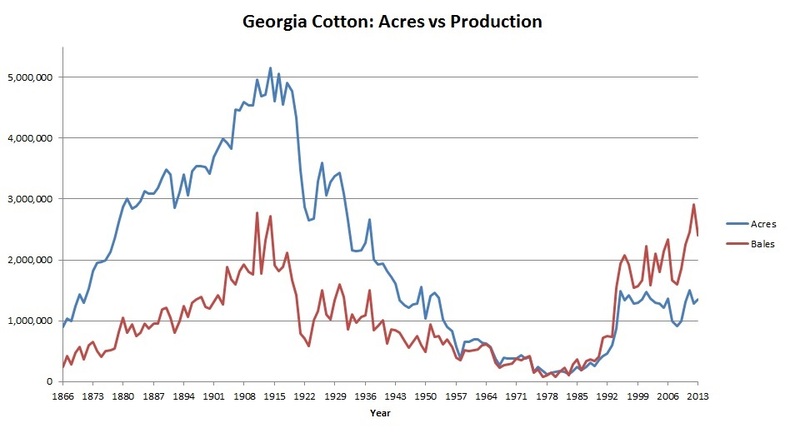 One that is less talked about though is the introduction of GMO cotton. The graph below is a zoomed in version of the above graph but only showing 1980 – 2013. The vertical line represents 1997, the year Roundup Ready and Bt cotton was introduced in the U.S. market. Though prior to 1997 we saw production (red line) go above acres (blue line), the per acre yield increase (the spread between the two lines) has risen dramatically since the introduction of GMO cotton. Looking specifically at the farm-level economic impact of this we can see that the five-year average GA cotton yield from 1991 – 1996 was 717 lbs/acre. From 2010 – 2014 the five-year average yield was 887 lbs/acre. Using NASS data again we can see that the five-year average price received of cotton in GA from 2010 – 2014 was $0.82/lb. That means that GMO cotton has increased the revenue of the GA cotton farmer by $139.40/acre. It must be noted that this doesn’t take into account the additional cost of GMO seed, we are only looking at the additional revenue from growing GMO cotton.